Arizona Cardinals Mini Speed Helmets - CASE OF 6 EACH - Login for CASE Price | Sports Memorabilia! 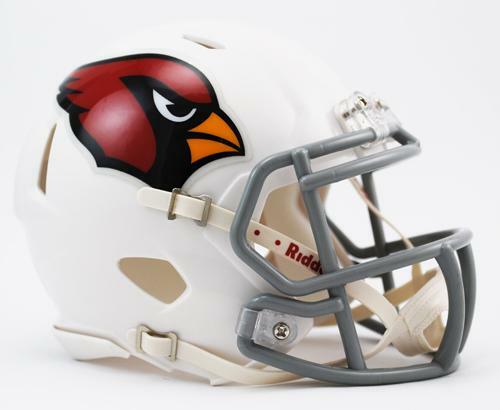 A full case of 6 each - Arizona Cardinals Mini Speed Helmets are a half-scale replica of one of the most popular new helmet introductions in Riddell’s history. The Riddell Speed Helmet design is the primary helmet used by the current NFL and college players of today. This Riddell Speed Helmet is the helmet of the future, replacing the traditional VSR4 helmets used on the field prior to 2011. It’s a must have item for any collection. Includes interior padding and a 4-point chinstrap. Official colors and decals. Great for autographs. Approx. 5” tall. Order in full cases of 6. 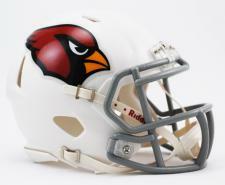 Visit this link for a single Cardinals Mini Speed Helmet.